He likes to act like he's in charge, but the silverback matriarch actually runs things. Arguable one of the STRONGEST cards in the game right now; if it weren't for the fact that he has a godly amount of power over Blizzard's decision-making for this game and everyone knows it, I would've been really surprised the bad boy hadn't received a nerf yet. - Used in 99.99% of decks as extreme tech for oppressive, broken cards like Magma Rager, and because he's basically Dr. 4 with his unholy level of power for ONLY 4 mana. - Picked 100% of the time in Arena for his utterly insane tempo-defining plays, AND "banned" 5 times, ignoring Blizzard's pleas each time to show "broken" cards like the DKs how it's really done. - Capable of countering nearly single card in the game (the only exception being itself, of course). Take Reno Jackson for example: 30 health is NOTHING compared to this literal beast, capable of carrying the entire board and ONLY needing to attack 30 times to complete trivialize your enemy's game plan! Every noticed how some "broken" card seems to dodge the nerf wave? There's a reason for that. That's right, Blizzard is spending their resources trying to nerf this god of a card instead, ultimately failing before his mightiness. In the end, Blizzard admits to their true failure: this card was possibly, - no, DEFINITELY, one of the first cards printed for this game, and will never be the last as everything single card in the game is modeled after it. To remove this card would to be remove this game from existence, then take the matter of time and space that carries it, crumple it up, spit on it, and throw in the garbage, in HELL. At the end of every day, I think about this card for hours. What would this game, and more so the world, be without this card? The inner lust inside of me CRAVES for the day this card will be removed the game, only to realize that this card adds the true touch to this game, making the game what it is. This card makes Hearthstone. This card IS Hearthstone. 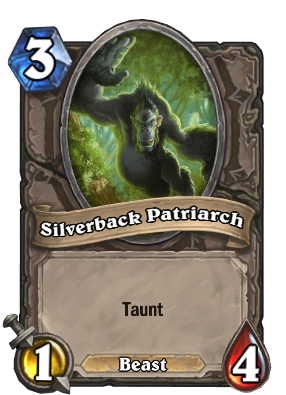 Silverback Patriarch has been obsoleted more times than pretty much any other card in the game. If they ever made changes to Basic cards, you can bet this would become a 2-drop in a heartbeat. Someone take out a reddit ad. This is something I can get behind. every expansion since GvG with the exception of TGT and BRM have introduced cards that clearly power creeped this card. Most recently with the Druid of the Swarm and Crypt Lord. Raise your hand if you wanna be unplayable. Shieldbearer: 1 less attack for 2 less mana and no beast. Twilight Geomancer: no beast and gives C'thun taunt for 1 less mana. Annoy-o-Tron: 2 less health for divine shield and mech (~beast) for 1 less mana. Squirming Tentacle: 1 more attack but no beast. Gnomeregan Infantry: Charge but no beast. Ironfur Grizzly: more balanced stats, 6>5 stats, still beast. Fierce Monkey: Class card but 2 more attack, still beast. EDIT: Tar Creeper : The biggest one yet, a 1/5 Taunt Neutral card, with +2 Attack on your opponent's turn and Elemental (~beast). And now we have Phantom Militia. Don't forget our newest addition! This card needs a buff, especially now that Fierce Monkey is a thing. They should buff this card by adding Deathrattle: Give you one Banana (+1/+1). This could help move this card from unplayable status to 'not so good but playable' card. this should be 2 but 3?